WASHINGTON (AP) — U.S. officials, frustrated that hundreds of military shipments heading out of Afghanistan have been stopped on the land route through Pakistan because of anti-American protests, face the possibility of flying out equipment at an additional cost of $1 billion. More than a week after Pakistani officials promised Defense Secretary Chuck Hagel that they would take “immediate action” to resolve the problem, dozens of protesters are still gathering on the busy overland route, posing a security threat to convoys carrying U.S. military equipment out of the war zone before combat ends a year from now. 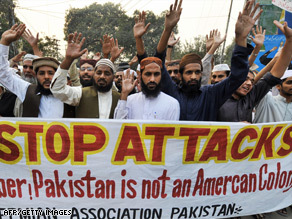 U.S. officials said Wednesday they have seen no effort by the Pakistanis to stop the protests, which prompted the U.S. three weeks ago to halt NATO cargo shipments going through the Torkham border crossing and toward the port city of Karachi. A Pakistani official says the government is looking for a peaceful settlement but notes that citizens have the right to protest as long as they are not violent. The U.S. officials, speaking on condition of anonymity because they were not authorized to speak publicly about the planning, said flying the military equipment out of Afghanistan to a port will cost five to seven times as much as it does to truck it through Pakistan. About a hundred trucks are stacked up at the border, and hundreds more are loaded and stalled in compounds, waiting to leave Afghanistan. 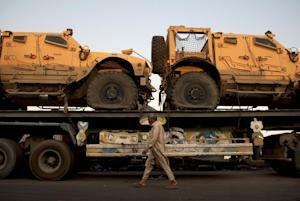 The shipments consist largely of military equipment that is no longer needed now that the Afghan war is ending. Sending the cargo out through the normal Pakistan routes will cost about $5 billion through the end of next year, said a defense official. Flying the heavy equipment, including armored vehicles, out of Afghanistan to ports in the Middle East, where it would be loaded onto ships, would cost about $6 billion if it continued through next year, said the official. A northern supply route, which runs through Uzbekistan and up to Russia, was used for about seven months last year when Pakistan shut down the southern passages after U.S. airstrikes accidentally killed 24 Pakistani soldiers at two border posts. That northern route, however, was used primarily to bring shipments into Afghanistan, and is much longer, more costly and often requires cargo to be transferred from trucks to rail. The deadlock, if not resolved, could also be costly for Pakistan. In private meetings in Islamabad early last week, Hagel warned Pakistani leaders that unless the military shipments resumed, political support could erode in Washington for an aid program that sends them billions of dollars. Hagel received assurances from Pakistan leaders during the meetings that they would resolve the problem but no progress has been made. Pentagon spokesman Adm. John Kirby said Hagel is concerned about the issue and has talked with his top commanders in the region about it. “He knows they (the commanders) are working the issue very hard,” Kirby said. But Marine Gen. Joseph Dunford, the top U.S. commander in Afghanistan, was in Pakistan on Monday for a meeting with Pakistan’s new Army chief, and it wasn’t clear if he broached the issue with him. The protesters are demonstrating against the CIA’s drone program, which has targeted and killed many terrorists but has also caused civilian casualties. The group gathers daily at a toll booth on the outskirts of the provincial capital of Peshawar, in Pakistan’s northern Khyber Paktunkhwa province. All traffic going into the tribal areas and on to the Torkham crossing must pass through the toll booth. Earlier this week, a group of about 40 protesters were at the toll booth, including about 10 who were waving flags as vehicles and trucks drove past. A makeshift enclosure was set up on the side of the road, complete with chairs arranged under a tent encircled by barbed wire to keep the protest from spilling into traffic. A few police officers stood nearby, with orders to allow the protests to go on but ensure that no one got unruly or attacked the drivers. He said the group has been stopping container trucks going into Afghanistan and looking at their papers to determine whether they are carrying cargo bound for NATO troops. If so, the protesters force the trucks to turn around. Khalid said the group got instructions not to stop trucks coming out of Afghanistan into Pakistan, and added that they’ve also noticed there has been little traffic coming from Karachi and heading into Afghanistan. Companies know, he said, that they will be turned back at the checkpoint. He said it has been about a week since the protesters encountered a truck carrying NATO goods. The protesters, however, appear to be in this for the long haul. Khalid had a schedule listing who would be manning the sit-in each day through mid-January. Officials from PTI said they had received no pressure from the federal government to stop the protests. Shah Farman, a PTI member who serves as the provincial information minister, said the national government, controlled by the Pakistan Muslim League-N, hasn’t moved to aggressively reopen the route because they don’t want to be seen as supporting the drone campaign. “Why is the federal government silent? Because they can’t go against the public pulse,” said Farman. Tasnim Aslam, a spokeswoman for the Ministry of Foreign Affairs, said a July 2012 agreement between Pakistan and the U.S. allows NATO to take supplies out of Afghanistan through Pakistan. But she said the issue is a sensitive one due to the widespread opposition to the U.S. drone strikes in Pakistan. Cargo usually goes through the Torkham crossing in northern Pakistan or the Chaman crossing in southern Pakistan’s Baluchistan province. As the U.S. drawdown in Afghanistan continues, the goal has been to move about 30 shipments per day out of Afghanistan to Karachi. Shipments through Torkham stopped in late November. U.S. officials say that just a small percentage is taken out through the Chaman route because it is more dangerous and crosses through the insurgency-plagued Baluchistan province.